Have you wondered making idlis/dosas without rice? Frankly speaking,I hadn't given a thought unless I started blogging.But how about a barley-oats idli/dosa without rice ?? Though I have seen many barley idli recipes but all had rice in them and I wished to make a barley idli/dosa without rice.Then,I thought to give a trial n error myself.If the recipe clicks,then surely will be an added advantage to my family and a credit to my space too.Fingers crossed over the ground batter(left for fermentation)!! In the morning,I found the batter fermented nicely.Excitedly,I prepared idlis and presented to my family. The idlis/dosas turned out so soft and moist that none could hardly make out the difference between regular ones.I asked my better half whether he knew what the idlis were made of and the usual comment was rice & urad dal?? ! !And finally when I told him the secret ingredient was barley and oats,he was very happy.The only difference I found is that the regular idlis were much brighter in color and barley oats idlis are light brownish white color.Barley is known to reduce blood sugar levels,lower cholesterol and helps in weight loss.On the other hand,oats are very rich in fiber and has many of the above properties as barley too.I have tried this recipe 4 times by now and for a change I made dosas too with the same batter,came out well. You may be wondering the reason behind my writing so much,I just wish all of you to try these soft idlis/dosas.Enjoy !!!! Wash the barley under running water 3-4 times and soak the barley with enough water.Wash the urad dal and soak in water.Add oats in third bowl,add just enough water to soak the oats.Don't add too much water for oats as the water can be drained easily once soaked.Soak barley for 6 hours; oats & urad dal for 2-3 hours. Grind the barley with minimal water and add oats to it when half done.Grind it smooth.Add the urad dal and grind again to smooth consistency. Mix the batter well and ferment for 7-8 hours.Add salt and pinch of baking soda just before preparing. Grease an idli mould with oil/ghee and pour ladle of batter in it.Steam cook the idlis for 8-10 mins until cooked. Remove from cooker and let it cool.Using a spoon scoop out the idlis and serve warm with tomato chutney or idli milagu podi !! Grind the batter slightly thinner than the idli batter with same ingredients and leave for fermentation just like for idlis. Heat a non stick pan /iron griddle.Pour laddle of batter spread it smoothly.Drizzle a tsp of oil on top.Flip both sides until lightly brown and crisp. Serve hot with chutneys !! * You can double the quantity and prepare much larger quantities or reduce to prepare smaller quantities.Just keeping the ratio same. * I usually add salt after fermentation but you can always mix it when placing for fermentation. * Use minimal water to grind the ingredients if you are planning to make idlis.If you plan to make dosas then the batter consistency can be thinner. * Adding baking soda is optional,but makes a very light soft idlis.If your batter is very well fermented,then skip this. I am yet to try with barley, the idlis look soft and fluffy.. Healthy and looks so inviting! ! Healthy and nutritious idly..... came out soft and fluffy! Barely oats idly looks delicious and healthy Julie dosayum kollam. 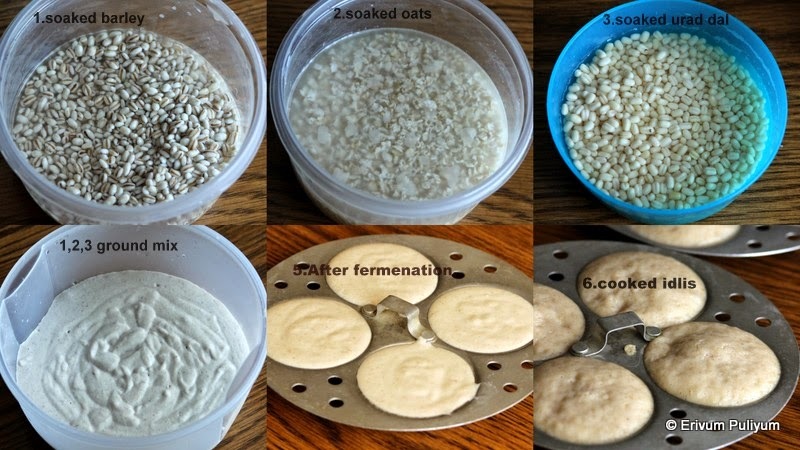 That's a very useful post Julie.. Will surely try it tomorrow.I love Barley and this looks yumm. Thanks.. Innovative and healthy; you succeeded in your experiment! wow..Julie!! me too am in an oats-cooking spree now..last two posts toow ere on oats intro on my page. and this is indeed another one for me to keep. thanks a bunch for sharing. Feel free to drop by mine too when you get the time. Healthy idli and dosa! And fantastic pictures! Take cre, missed you at my site. Very healthy idli and dosa... idlis looks so soft and yummy. Wow without rice, such a beautiful and spongy idlis, those dosas are inviting me. I have to bookmark this recipe and try this. The combination sounds healthy and the texture of the idli looks soft and airy. such a healthy idli&dosa..nice pics again dear..
Hi I tried this recipe as it is - my dosas were fine but idlis turned out to be too moist and gooey inside unlike the rice ones. Thanks for the feedback..I think the batter for idlis got over fermented and probably it wasn't cooked properly.. I never had any issues as such, better luck next time ! I am really thankful to you for this recipe. I was diagnosed with gestational diabetes and this recipe is the best be it for breakfast lunch or dinner. I usually make dosas .Barley oats and urad dal is probably best combination to control blood sugars. Thanks once again. @Nirmalatm Thanks dear for the feedback,am happy that the recipe worked for u.. Best wishes ! !